Our facility is located in Spanish Fork Utah, 50 miles south of Salt Lake City. Temperatures here vary from high 90's in the summer to the low single digits in winter. The large temperature changes have proven to be quite a challenge for us. Our snakes are housed in a large commercial warehouse type space that has been modified for them and just next door is the rodent colony. The rodent area has been divided into three separate rooms. The largest room houses the feed, shavings and other supplies required for maintaining a rodent colony. The other two sections contain mice and rats respectively. The mouse room is equipped with ARS rodent racks and an automatic watering system. Each cage is cleaned weekly and new adults are put into the system on a regular basis. The rat room is about twice the size of the mouse room and is filled to the brim with caging and rats. More than enough to keep our collection well fed. Both rooms are equipped with swamp coolers to keep them nice and cool in the summer. Exhaust fans and louvered vents are also installed in each room to maximize airflow. The area that houses the snakes needed some modifying before the snakes could be moved in. Sinks were installed along with more power and additional lighting. The exterior roof and part of the back wall was heavily insulated with a special insulation that keeps the heat in during winter and the heat out during the summer. We also brought an ultrasonic humidifier to help raise the ambient humidity in the snake room. This was necessary due to the relatively dry air in Utah. Numerous ceiling fans were installed to help facilitate air circulation and proper temperature gradients in the room. 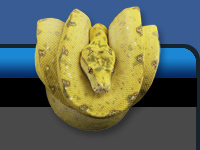 The ball pythons are kept on one side of the room and the boas and green tree pythons are on the other side. Supplies are stored in an office adjoining the two rooms. The space were the snake room is has two office areas. We took one of these offices and heavily insulated it and turned it into an incubator. It has taken some time to get used to using a square room instead of a rectangular room for an incubator. We needed to change what we used for shelving to hold the egg boxes. We now use metal racks from Costco. We use several fans to keep the air circulating to avoid dead air spots. Our Helix Control is still doing its job regulating the temperature that we use to incubate our eggs. We now incubate our eggs at 88 degrees instead of 89. 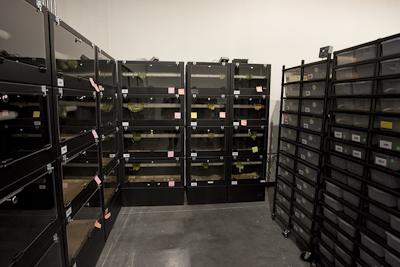 All of our snakes are housed in individual cages from the time they hatch or are born. Each animal is labeled with its own unique ID number. At this time we are using shredded aspen as a substrate.